Finish carpentry can be composed of three actions: measuring, cutting and attaching. The list of installations includes doors, trim, moldings, cabinets, stair bannisters, shelving and everything needed to finish the interior of a home. Finish carpentry might seem simple but it's highly visible, and you need a certain level of woodworking skill to produce tight joints and level installations. Finish carpentry may be delicate work. Finish carpentry doesn't involve building cabinets or doors, installing floors, windows, appliances or countertops; those jobs typically are contracted to others. If cabinets are custom made, the producer typically installs them. Trim carpenters don't work outside, so exterior trim is done by others. Trim carpentry typically doesn't involve painting, but it may involve finishing doors or trim, which sometimes is necessary depending on the contractor. Basic finishing often requires a miter saw. A power miter saw is best, but it can be done with a miter box. Handsaws include a short, fine-cutting backsaw for trimming moldings by hand. Other hand tools include chisels and a lightweight trim hammer with smooth face to prevent damage to trim. Include a variety of nailsets and a pair of diagonal pliers to remove bent nails. 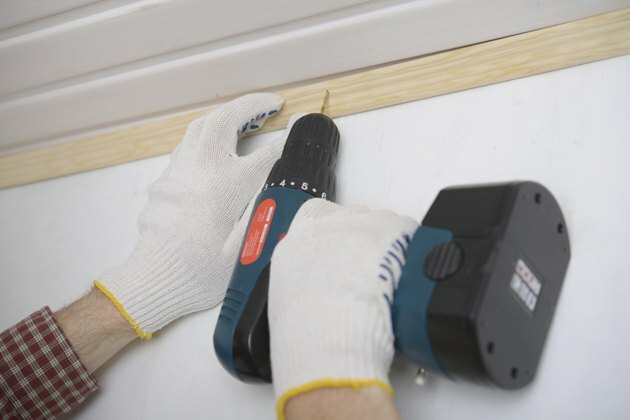 Contemporary trim carpenters use finish nailers for efficiency and the fact that air guns set the nail head, leaving only a small hole to fill. If you're considering a career in finish carpentry, include a portable table saw. Other supplies include a utility knife, files, hand-sanding blocks, sandpaper, wood putty, clear finishes and stain. Experienced finish carpenters use circular saws to cut panels and install cabinets that require scribing. Scribing utilizes a small tool that looks like a compass. It works by transferring uneven wall lines to cabinets, or when other wooden parts such as mantels or trim fit against rock or masonry. Once the item is scribed, it can be cut to fit with a saw. Another specialty skill involves a hand-held coping saw. Professional carpenters use a coping saw to cut angles on inside mitered corners, preventing gaps on molding or trim. Coping saws go hand-in-hand with sandpaper, files and chisels to fine-tune the cut before installation. Trim carpenters typically begin the job by installing shelves where needed, followed by bi-fold and walk-through doors. If doors and trim are unfinished, it's sometimes necessary to finish them before installation, so some spray equipment is beneficial. Most walk-through door units are pre-hung, meaning they're already hung on jambs. Door hanging is a process of installing the unit in the opening, ensuring it's level and plumb, and screwing it to studs. Doors and windows typically require casing or trim with 45-degree miters at the corners. Trim carpenters prefer pin, brad or finish nailers to attach it, and putty crayon to fill the holes. If the job is painted, wood dough that hardens is best for filling holes. Finish carpenters are responsible for a final inspection before the home is occupied. Stair railings, baseboard and casings, mantels, architectural moldings and everything related to finish carpentry should be solid and tight. Walk-through and bi-fold closet doors should work properly. A good finish carpenter checks for scratches, putty smears and dents or gaps, repairs them, and cleans up the mess.